Our staff is standing by. If you have any questions or would like to request a quote, call us and our customer service representatives can assist you. 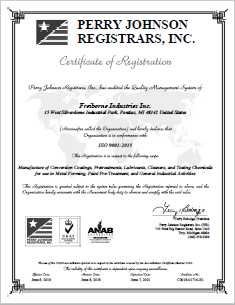 Freiborne has been providing surface chemistry solutions and service for metal-forming, paint pretreatment and general industry applications for more than forty years. Our sustainability is due to our ability to earn and maintain a reputation for consistently developing, manufacturing, and selling quality products and services – which are a long term value to our customers.